Next page: clouds? Hell, it ain't Glasto without 'em! Björn Again kick off Glastonbury proper, to a wet but determined audience of ponchos. They opened with Waterloo, but are currently playing... Rocking All Over The World?! Yep - it's definitely Glastonbury. But so muddy so soon? It's gonna get worse! Give peas a chance. And bees while we're here. "The band's vocals sounded a bit tinny..."
The Invisible Man enjoyed his first taste of Glastonbury 2009. Tribute or cash in? Michael Jackson RIP t-shirt featured less than 24 hours after the announcement. Hmm. Hot 8 Brass Band cover Snoop Dogg - a big festival moment. What do you reckon, Tweeps - should I get one? 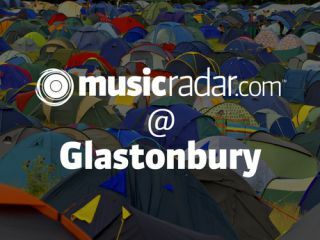 Let me know via our Twitter Channel - drop me a line @MusicRadar and mention #glasto. Dubstep's favourite sons Skream and Benga kill it with a seriously heavy remix of Hold The Line by scenesters fave Major Lazer. Dubstep mash-up? Hell yeah. Inevitibility alert: Skream plays his massive (if slightly overplayed) remix of La Roux's In For The Kill. Nice flowers, @mikeskinner, very very nice flowers. ... whilst Tina Turner makes for the finish line via backstage. And beyond the thunderdome. Tina Turner was in Wacky Races, right? Our first proper Glasto moment. This is The Streets doing Billie Jean - I can hardly hear the band over the crowd. Bloody hell. Forgive the blurry "camerawork" but my hands are properly shaking - in the distance, that is the legendary Q-Tip and this journo is now officially in heaven. It might not look like much but through the murk, Q-Tip is currently playing the Jackson 5-sampling (Dancing Machine, to be precise) Move to an unsurprisingly now-ballistic crowd. Okay, that's it for Friday. Apologies for the sometimes dodgy camerawork and wanton adoration of Mr Skinner. I'm off for some kip and we'll see you sometime tomorrow (unless I drop the camera in the portaloos). Jon.